3 How Many Calories Do Oats Contain? Whether gooey and cookie-like or fluffy and cake-like, chocolate brownies lend a delicious dessert to a box lunch, provide a sweet send-off for dinner or are a decadent accompaniment to afternoon tea or coffee. If you're looking to boost the health quotient of your brownies, you can make several modifications to your usual fat-and-sugar-laden recipe. Experiment with different approaches to find the modification that tastes best to your family. Substitute white whole wheat flour for half of the white flour in your brownie recipe. White whole wheat flour is made from hard white wheat that has a lighter bran and a lighter taste than regular whole wheat flour. It will add healthy fiber to your brownie. 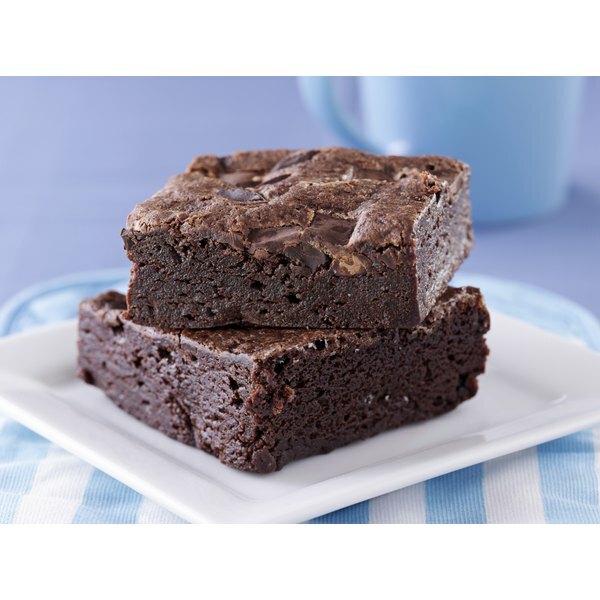 Replace one-half of the fat in your brownie with an equal amount of applesauce, prune puree or mashed white beans. The prune puree provides the richest taste. All of these non-fat options will replace the bulk the fat provides and add extra fiber and fewer calories. Reduce the amount of sugar in your recipe. You can usually safely reduce the sugar in a recipe by 1/3 without affecting the final outcome of your baked good. Use cocoa instead of melted baking chocolate to make brownies healthier. For each ounce of chocolate called for in your recipe, use 3 tablespoons of cocoa. This reduces the amount of fat in your recipe. Use two egg whites for each egg called for in your recipe. This reduces the calories, cholesterol and fat in the brownies.